"I am an art student in my fifth year of study and my final year doing my masters. For my masters I am painting from my experiences in Tacloban. Last year I studied for my honours degree and worked part time. In the middle of 2013 my part time job ended and on the same day I met a lady going to china to set up her fourth orphanage. I told her I have no job but I will fundraise to go and help. I fundraised by having a quiz night and raised the money for my ticket plus $1 and I bought the ticket to go with her. About November 2013 she rang me to say we couldn’t go due to unforeseen circumstances. So I was left with a plane ticket. I heard about the Ruel foundation through a friend of my mothers and I contacted them via email and asked if I could help in the orphanage in Mindoro in the Philippines. The Ruel Foundation is a faith based, humanitarian organisation They run a fifty bed children's crisis centre for small children living in poverty and in life threatening situations such as starvation, physical abuse or abandonment and provide free medical aid to children with physical deformities such as cleft lip and palate in developing nations. They welcomed me and asked if I would come and paint some murals on the wall and work some 8 hour shifts in the orphanage. So I transferred the ticket and fundraised by selling my art and was given donations from friends, family and some wonderful people. On December 16th the island of Mindoro in the Philippines. I worked in the Ruel orphanage and painted 2 murals on their walls. The orphanage has 27 children at the moment ranging from 4months to 10years. It was a wonderful experience and I got to see the great work the Ruel Foundation is doing for abandoned children. I stayed for 5 weeks and on the 6th the chance to fly with the Orphanage Director Pauline Curtis smith, Grace her social worker, and Cecile a volunteer from Netherlands to Tacloban where the Typhoon Haiyan (Yolanda) hit in November 8th. This was Pauline’s 3rd trip in since the Typhoon. We stayed in a house that was abandoned by the owners as two of their staff where trapped in a room by the flood waters and they drowned. We worked with Kids international ministry. We slept in pup tents, there were 17 in the house and when we left 21 arrived from America. There were many mosquitos and we had a generator from 6-10pm. On the first day we helped with a feeding program. We collected food from a church which was in large plastic containers and drove around many districts and fed people. They were so appreciative and cued up for the food. They would run up with whatever container they could find and we would spoon in the hot food. They went out twice each day and drove around in an old van feeding and also helped with building houses. The devastation is so vast they went to a different area each day. Many families had lost everything and had just made a shelter out of whatever they could find. The Third day we went to interview families for housing. Pauline and Grace interviewed and Cecile and I were taught by Pauline how to treat wounds, so we scouted the villages for children and adults to be treated. We just found a piece of tin on the ground and lay out our gear and had many lining up to be treated. 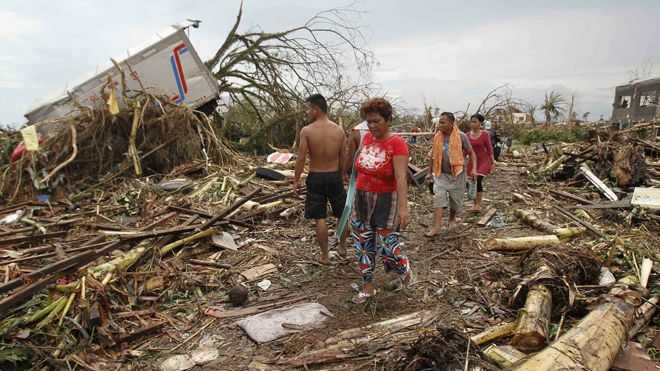 The destruction was daunting and in my 5 days there I never saw any power lines being repaired or other feeding programs, although Tacloban is so huge that we may have not been in the areas they were. Some families had 8 or 10 children and many had no job or income. We went for 5 days to find families of 3 or more children and give them income. You could see the trauma still on the faces of the people who were still in shock. In one district a lady told me they were told in English that there would be a water surge when the typhoon hit but many don’t speak English and didn’t understand. She said that her whole village ran up the only hill near them and stayed there all night while the typhoon hit, in the morning they came down and all the houses where under water, she said it was terrifying. In the afternoon we went to the hospital to visit the babies and children. It was very traumatic as many parents cannot afford the prescriptions and cannot buy the medication their children needed. We tried to get blood for a wee boy who was 7 years old and were told the father had to find a donor. He didn’t live in the town and didn’t have any money to pay for it. This child was dying in front of us. We gave a person 80 pesos to donate their blood 50 pesos is $1.40. We also gave donated money to many other families whose children were in pain and suffering. The least they deserved was to die pain free. I went back the next day on my own and the families showed me what they had purchased for her sick and dying children they were in tears with gratitude for the help. In the afternoon I was waiting for the feeding team to arrive back and went out with my video onto the street. I saw some locals who were employed by the United Nations to clean the streets. They are given 250 peso a day to clean and many who usually had good jobs where doing this as they had no work place left. I asked if I could join and help they were amazed a foreigner wanted to help. I put on my gumboots and pants and gloves. It was an amazing experience and they were so appreciative. We dragged the rubbish about a km as no truck could fit down the streets and the trucks were very few. There were about 30 in the team and it was hot dirty work. In the morning one of the street cleaners came and gave me an ‘I love Tacloban” t-shirt for helping. I was amazed at the generosity and kindness we received for the little we did. These are just a few of the amazing experiences I had in Tacloban the people are desperate for help. For $700 NZ dollars a house can be built for a family!!!! When Pauline took in the donated money and chose a family. The building started the very next day! Since I have been home I have started fundraising for more houses. We are so lucky to live in such a beautiful country, where we can flush a toilet, turn on a tap, be treated in hospital and looked after when we are elderly."